see no reason to believe that dropping the mandate will do anything to increase support for the President, the Democrats, or the ACA. Roger that. Opposition to ACA is as much down to cultural markers as it is to substantive objections to what the law does. On the other hand, I’m not sure the chart on the right makes quite the point Aaron implies. What it shows is that if the mandate is overturned, premiums will go up for everyone who does buy health insurance. 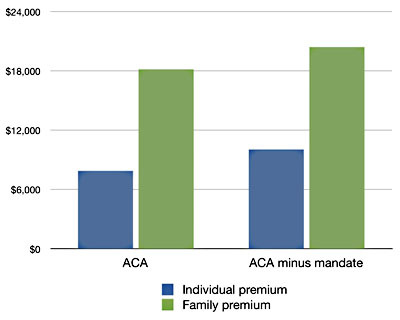 In theory, that’s a point in favor of the mandate: it keeps average premium costs lower. In reality, it means that if the mandate is overturned, opponents will simply have one more rock to throw at ACA. They said premiums would be affordable, but look! They’re out of control! The only answer is to repeal the whole law. Which is more or less what Aaron thinks opponents will say regardless of any actual facts or evidence. And he’s right.